Lectrosonics patented Digital Hybrid technology revolutionizes wireless microphone transmission. Digital audio signal is converted and encoded for analog transmission, then decoded and converted back to digital audio at the receiver. The result is an exceptionally low noise floor as the compandor circuit is eliminated and clear audio reception is retained at greater distances. The non-corrosive, machined aluminum casing is splash proof and features an LCD display with membrane switch control panel. The transmitter is powered by two AA lithium, NiMH or alkaline batteries for up to 14.5 hours (lithium). The SMQV transmitter is completely compatible with all Lectrosonics Digital Hybrid wireless receivers, as well as older Lectrosonics analog receivers. The SMQV features selectable 50, 100, 250 mW output power. The miniature design allows for a variety of mounting possibilities in film, video, theater, performances, etc. 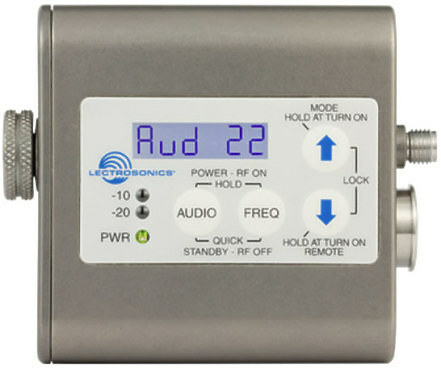 Lectrosonics incorporates digital and analog audio technology to enhance range and eliminate the noise associated with compandor circuits. A locking TA5M input is compatible with Lectrosonics and third-party microphones and cables. The input accepts line and microphone level signal. The SMQV transmitter is completely compatible with all current Lectrosonics Digital Hybrid receivers and older Lectrosonics analog receiver models as well. The polished aluminum enclosure is moisture proof and ideal for use in rain. The SMQV transmitter is powered by two AA alkaline, NiMH or lithium rechargeable batteries. With Lithium power, the unit is capable of up to 14.5 hours of use.